Winter briefly covered over autumn last weekend here in New York City, in a rare October snowstorm. 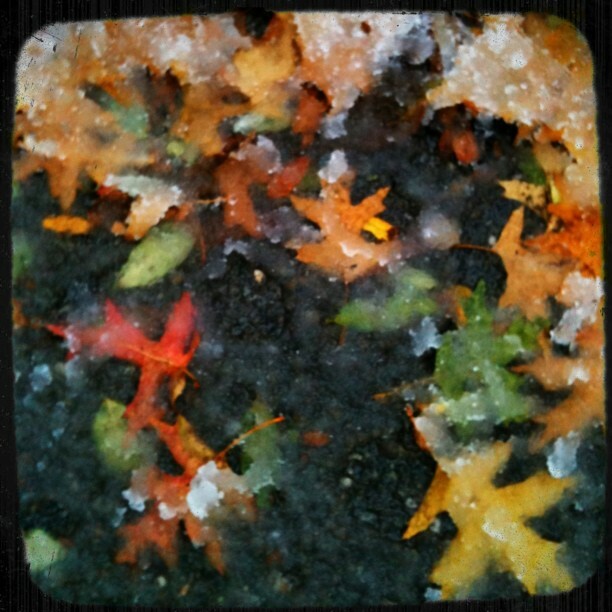 In an instant, the beautiful colored leaves were covered over by snow and ice. Their bright and lovely forms shining through the wintry cover, trying not to allow their time on the ground to be cut short by an early snow. Sorry I haven't been around much lovely blog friends. Work has been busy, but I've got to find the time to post a little more regularly. I promise to come around visiting when I get home from work tonight! Sharing at The Creative Exchange today. A beautiful pairing of two distinct seasons - a nature mash-up! I can't imagine how wild things have been with that crazy storm. Have a great day! Oh, I love these shots!! The last one especially! I live just an hour north of NYC and what a crazy storm this was! THanks for sharing these! I'm kinda disappointed that autumn hasn't been given a chance this year...all this cold air can go away! Beautiful shots though. Wow, you had quite the storm! Ours amounted to big flakes, a very light dusting, and then rain that washed it away. 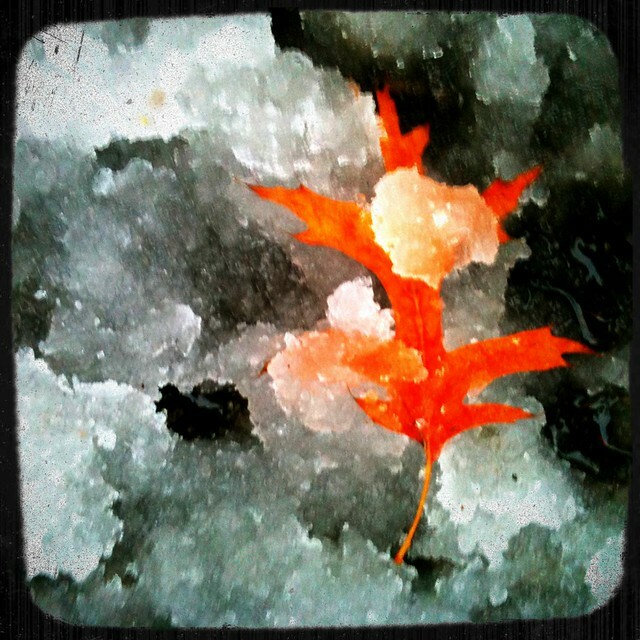 The contrast of autumn color and ice and snow is wonderfully dramatic. Great captures, perfect for the CE! Such crazy weather. Autumn has only just started here in the south of the UK. Interesting effects and cool pictures. I have just found some time to visit blogs too and have discovered that the autumn snowstorm not only created all kinds of havoc but also some beautiful photos! So pretty. I love the color pop of that second shot! I can't believe it already snowed in NYC. My first year living in Chicago, it snowed in mid-October and there was a good 17 inches on the ground by Thanksgiving. I thought my life was over. Luckily, like you said, those October snowstorms are rare! Thank you so much for sharing at The Creative Exchange this week. Very cool captures!! I am not ready for winter yet. I love that week where you can catch the two seasons blend. Snow?? How odd! Been busy here too... seems like it's in the air. Have a good day! 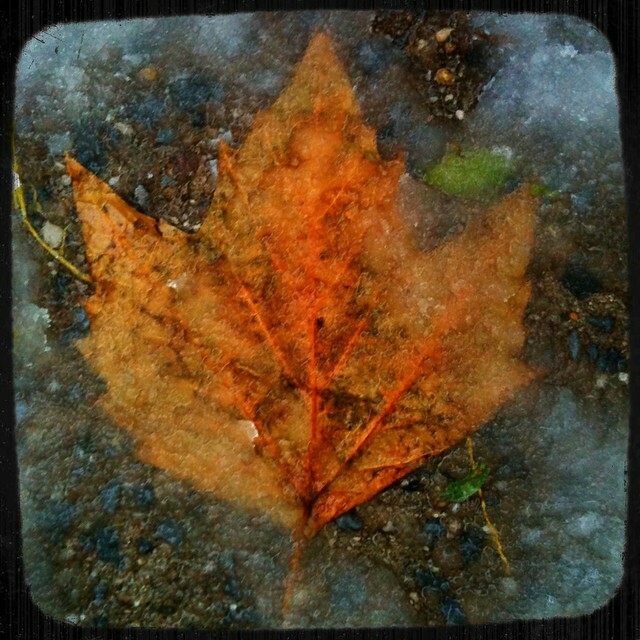 Love those rich autumn colours showing through the ice, particularly the last one. We're the opposite here in the UK - it's November and we haven't needed to put the heating on yet.